Mix fruit, pecans, brown sugar, and butter in small bowl. Reserve. Core apples by cutting to, but not through, bottoms. Peel top one-third of each apple. 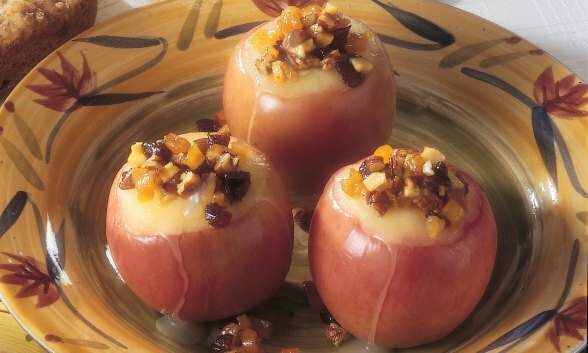 Fill cavity in each apple with 2 rounded tablespoons of fruit mixture. Place filled apples in baking pan on rack* in Presto® Electric Skillet. Add 1 inch of hot water to skillet. Heat at 400° until water is boiling. Reduce heat to simmer, between Warm and 200°. Cook, covered, until apples are tender, about 20 to 25 minutes. Combine cornstarch and apple juice in small saucepan until smooth. Cook over medium heat to boiling, stirring frequently. Boil until mixture thickens and is clear, stirring constantly. Serve over warm apples. Skillet Rack for 16-inch Models. Skillet Rack for 11- and 12-inch Models. Skillet Rack for Oval-Shaped Models. *Use a small cooling rack. If necessary canning jar metal rings can be used in place of a rack.